So just got back from a lovely holiday in Turkey. I had a great time eating all that delicious Turkish food and discovering the beauty of the country. The best part was the sun (of course), eating watermelons 3 times a day, visiting family members and shopping 🙂 While being back in cold Belgium and trying to adapt myself is hard I find making lots of Turkish food quite helps. Therefore, the next few weeks I’ll be sharing 3 Turkish recipes. Today’s recipe and the first out of the 3 will be Cacik! This dish eaten throughout almost all the former Ottoman countries, is very delicious and again very simple to make. It is made with yoghurt, which is actually a Turkish word. 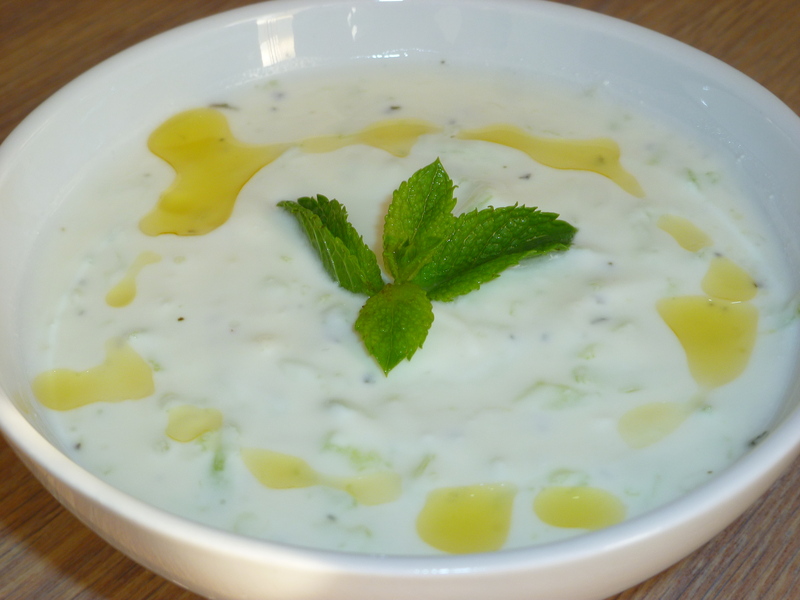 Anyone who has ever been to Turkey knows that yoghurt occupies an important place in the Turkish cuisine. Cacik is eaten as an appetizer (meze), sauce or as a side dish. Thick or diluted with water (depending on the occasion and food served) it can be served alongside everything, especially with meat dishes and rice. I think it’s an excellent choice on hot summer days for its refreshing and healthy ingredients. 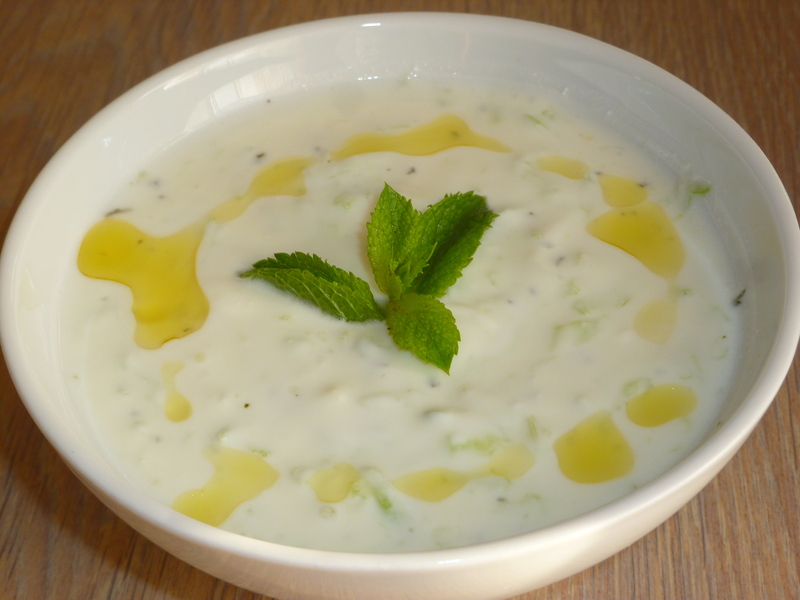 Cacik is quite similar to the Greek tzatziki (except that tzatziki is only consumed in the thicker version). Chop the cucumber finely or grate it (I always grate it) in a bowl. Add the yoghurt and mix to see if you need more. Crush the garlic and add it to the yoghurt. Lastly, add the spices (I prefer mint and dill but thyme is fine if you don’t have dill) and the water. Stir until you get a smooth consistency. Leave it in the fridge for a few hours so the ingredients can blend nicely. Pour into bowls, garnish with fresh mint leaves, drizzle some olive oil on top and serve. Like I said, this recipe is so great that it goes with everything. Besides using it as a dip sauce, meze and side dish, Turks also eat it on its own as a soup (similar to the Spanish gazpacho) by mixing it with ice cold water. This entry was posted in Appetizers/mezes and tagged Cacik, salad, Turkish, Turkish cuisine, Tzatziki, vegetarian, Yoghurt. I thought the most obvious thing to do after Spain would be posting a Spanish recipe. Not just any recipe but a typical summer one. For those going to Spain any time soon maybe a word of warning: Be prepared it’s too hot! How hot? Well, Madrid was like 42 degrees (and Andalusia is even hotter). So if you’re not used to it avoid the midday sun. If you have to go outside try to find a place in ‘la sombra’ and wear a hat, a big hat, that covers up your shoulders. That said, it’s time for our delicious summertime recipe. This week’s dish will be the refreshing GAZPACHO. Also known as the Spanish cold soup. Although I’m not really a fan of cold soups this one is actually not that bad at all. Especially during warm days when we can lose our appetite experts recommend eating plenty of tomatoes, cucumbers, watermelons, pineapples etc. (known as cold foods in chinese medicine, see below). Light meals such as gazpacho are therefore ideal to beat the heat a bit 🙂 As for me, I’m going to Turkey tomorrow so I’m probably not going to be around for the next 3 weeks. Happy holidays! Peel the tomatoes, chop them roughly and put in a food processor. Chop the other vegetables roughly too and place them all in the food processor. Puree the mixture until everything gets smooth. Take the mixture into a bowl and add tomato paste and sambal to the mixture. Stir till everything combines well. 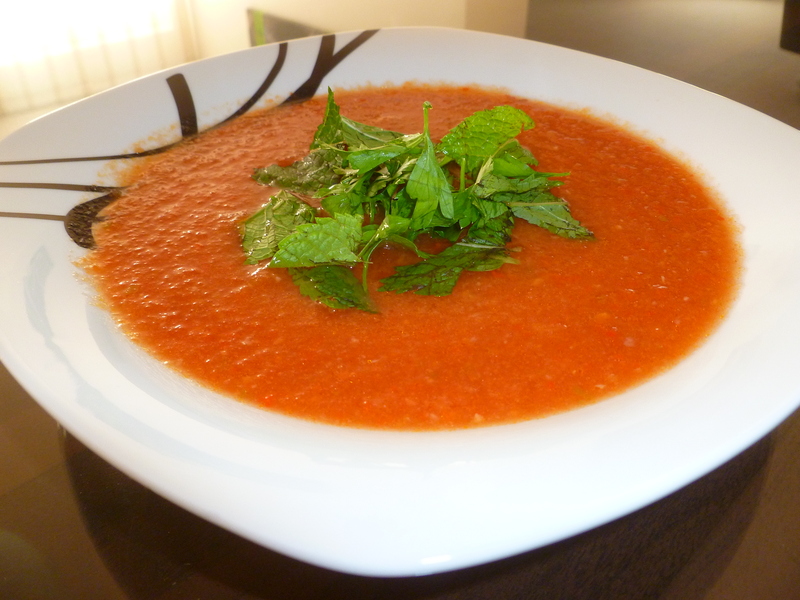 Lastly, add vinegar, olive oil, salt and pepper and garnish your gazpacho with chopped mint leaves and parsley. Serve cool and with bread! 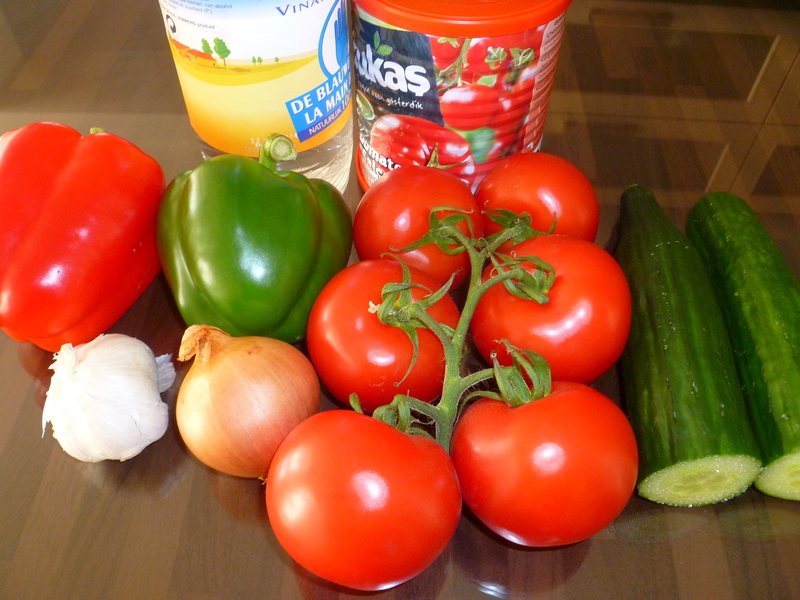 This entry was posted in Soups and tagged Gazpacho, Soup, Spain, vegetarian.